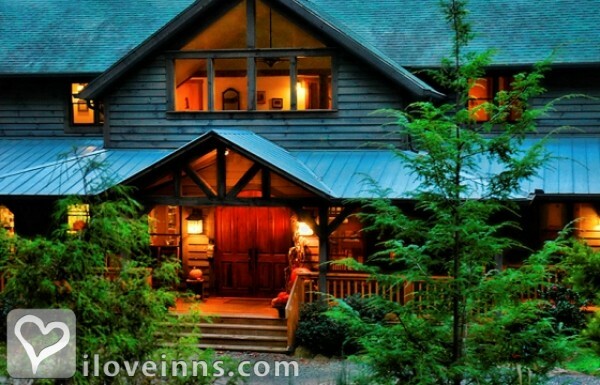 Surrounded by 160 wooded acres, this rustic mountain retreat was designed to sit serenely amid the scenery. 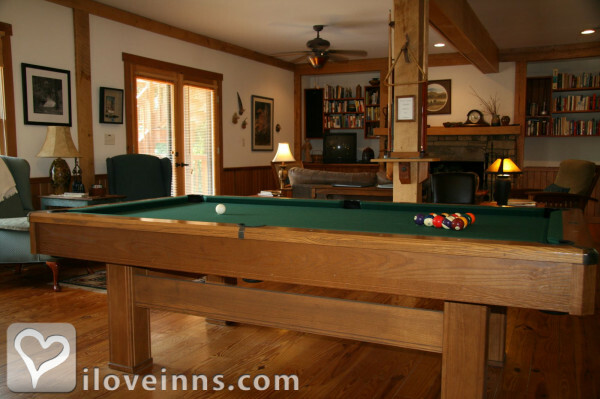 The sprawling wooden lodge with pine floors boasts a great room with an inviting stone fireplace and billiards. Antiques and handcrafted furnishings grace the guest bedrooms, decorated in regional themes that reflect the variety of the state. Themes include tobacco barns, water, biking, birds, Outer Banks and wildflowers. 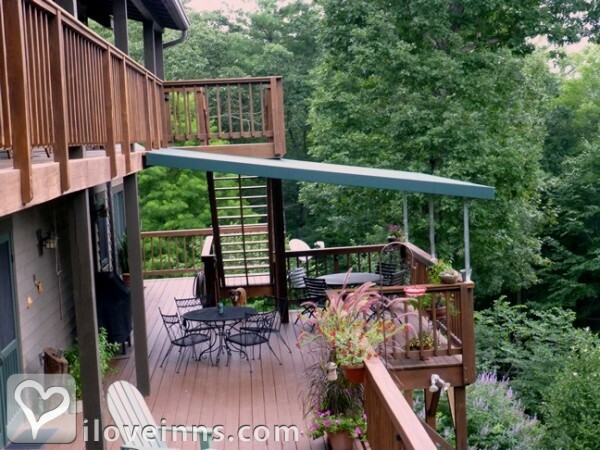 Some offer whirlpool tubs, and most have balconies with mountain and forest views. Fresh ingredients are used in Apple and Mascarpone-Stuffed French Toast, Smoked Trout Hash and other delicious breakfast foods. Enjoy the view from one of the three decks while planning tomorrow's adventures. Payment Types Accepted Include Visa, Master Card, American Express, Personal Checks, Travelers Checks and Discover. This property has 10 total guest accommodations with private bath, 3 with whirlpools, 1 guest house and 1 conference room. The types of beds available include Double, Queen and King. 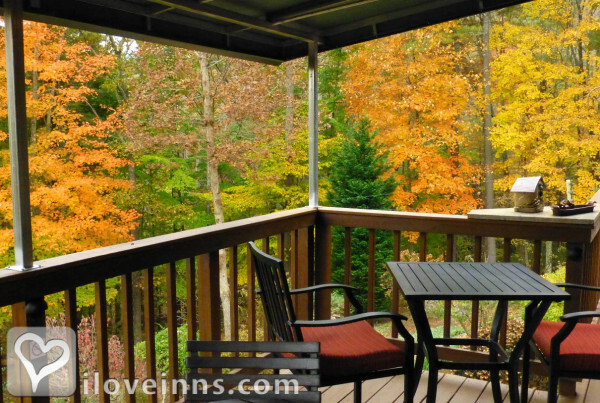 Our wooded setting makes you feel that you have escaped the crowds. Choose to have roses and luxurious chocolates waiting in your room to pamper your partner, then retreat to an intimate, bubbly bath in one of our two person whirlpool tubs for the perfect romantic get-away. We make every effort to be environmentally conscious. We recycle all containers allowable. We compost all of our kitchen fruit and vegetable scraps. We have switched to LED lights and use very efficient Rinnai hot water heaters. We switched to water dispensers with real glasses and soap and shampoo dispensers to reduce our use of plastics at the Lodge. From every vantage point, all you see is our gardens, the woods and mountain views beyond. Our back decks overlook a winding trail through a rose trellis and along extensive blooms of perrenials and native plants. 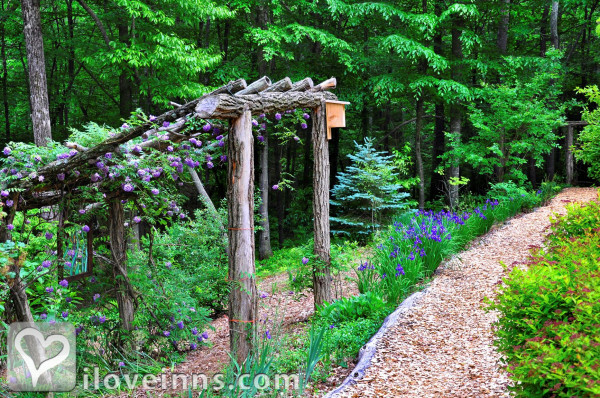 At the end of our landscaped area, you pass through our swinging gate of rhododendron limbs to a fire ring by the creek, then across the locust bridge to miles of hiking trails. Jodee's favorite room, the walls and accents in soft, soothing greens, give the Fern Room the feel of a lush, forest glen. Get lost in the luxurious king size bed. The spacious bath has an oversized, two person jetted tub. The back door opens to the large, covered deck overlooking the garden with swings and rockers. It is adjacent to the downstairs sitting room on the west end of the lodge.. The Water Room was inspired by the waterfalls, rivers and streams we love in this area. 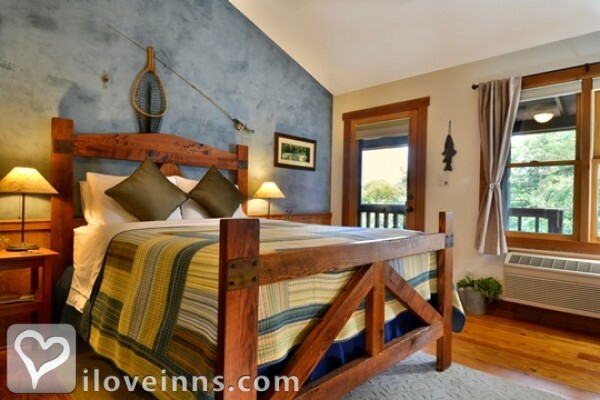 The blue accent wall behind the Heart Pine trestle bed makes you feel like you are resting beside the water after a day of fishing or canoeing. Write in your journal or check email at the warm, pine desk. The room is on the west end of the second floor and has a private entrance to the upstairs balcony and mountain views beyond. The spacious, glass enclosed shower in the large, airy bath gives you the feel of bathing in a warm waterfall. It is adjacent to the Bike Room. The bedroom can accommodate a third person with our portable bed if needed. There is a $35 per night fee for a third person in the room. This cheerful room with the old timey, big wheel bike art and the antique bike poster reminds you of simpler times and simpler bikes. It has a back door to the 2nd floor balcony for long range views. The black, queen size, iron bed with all the tasteful black accents gives the room an air of sophistication. Closely check out the quilt hanging on the wall, it even has little bike patterns, what a find. 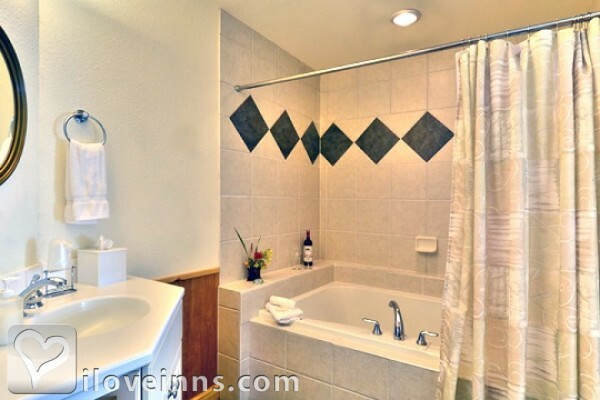 The ceramic tile bath has a combination tub & shower. It is adjacent to the Water Room and the Bird Room. Since our lodge was built in 1998 our history does not go back very far. However, guests always enjoy our Blurb book describing, in words and photos, our struggles to find the property, design the lodge ourselves and use the trees from the site to build. The Biltmore Estate with it's grand mansion, beautiful gardens, working winery, historic River Bend Farm and Antler Hill, is a "must see" for Asheville visitors and residents alike. Add our Biltmore Package with a two night stay and get two tickets to the Biltmore Estate good for any (2) consecutive days for $130. This will save you up to $30 compared to Saturday gate prices and you get the second day free. Valid from 03/20/2019 through 12/31/2019. While we require a two night stay on most weekends we often have availability for a "one nighter" due to extended stays ending on a Friday or starting on a Saturday. So if you can only get away for a single night, give us a call, we may be able to accomodate you even if the computer doesn't know it. Valid from 04/07/2012 through 06/01/2020. Reserve a stay of 4 or more nights and ask for the Extended Stay Discount in the special accommodation block or on the phone to get 10% off the room reservation! The 10% discount is for the room reservation only. Valid from 04/07/2012 through 01/01/2020. Valid from 01/14/2012 through 01/01/2020. With our Last Minute Special, book a room the day before or the day of your stay and get 10% off our Midweek or Weekend rates. The Last Minute Special is good for a one or two night stay! List the Special in the notes block when reserving online or call us. Valid from 04/07/2012 through 12/31/2019. Thank y'all so much for a beautiful place to unwind after a long day of adventures! We felt pampered with breakfast and quiet and happy in the evenings with the fire. Thank you for being a safe and satisfying retreat for us for more than 14 years now! We loved our stay, as we always do, and can't wait to come back again. We got to do a lot of things for the first time on this trip. The staff were wonderful and the breakfast was amazing. We hope to come back and make great memories again Thank you for the great experience! A pleasure to stay here once again. Everyone went over and beyond to make our stay fabulous. We can't wait to come back again someday. Thank you for everything. We escaped our busy lives to retreat for some rest and relaxation. We so desperately needed the downtime. Thanks for the amazing hospitality . This is exactly what we were needing! Thank you also for catering to my special Gluten Free diet. Breakfasts were absolutely delicious. We'll definitely be sharing the good news about the Bent Creek Lodge. Bent Creek Lodge was our first ever bed and breakfast stay. My husband and I loved the view of the forest from our Tree Room, the trail in the back, rocking chairs and swings on the patio. We loved the hospitality and the absolute comfort of our room and the entire lodge. Breakfast was amazing and we hope to come again soon! Thank you so much for a memorable Babymoon. I am writing this note by lovely candle light, as the big snowstorm took out the power for us. But Jodee, Doug, Heather, and Lisa have made this stay an awesome adventure! Bent Creek Lodge was transformed from a B&B to a B,B, L&D by our incredible hosts. I can't state strongly enough how fantastic Kristen and my stay was--days of fun in town followed by comfy and caring hospitality by all. Delicious meals, beautiful surroundings, and a bear sighting to boot. One of the most welcoming says I've ever experienced, truly a five-star one-of-a-kind visit. Thank you so much to all for opening your beautiful inn to us. Take care and stay warm. My best friend and I came here on vacation to "get away". What a gem we found here. We couldn't imagine a better place to be snowed in. We had the perfect view, a cozy nook, excellent food, and warm hospitality. In the 20+ years we have been friends, we have never gotten the opportunity to play in the snow together. Thank you Jodee for finding sleds for us! We have had the best time here, and are not ready to go back! Thank you Doug and Jodee for everything-you made our stay perfect! 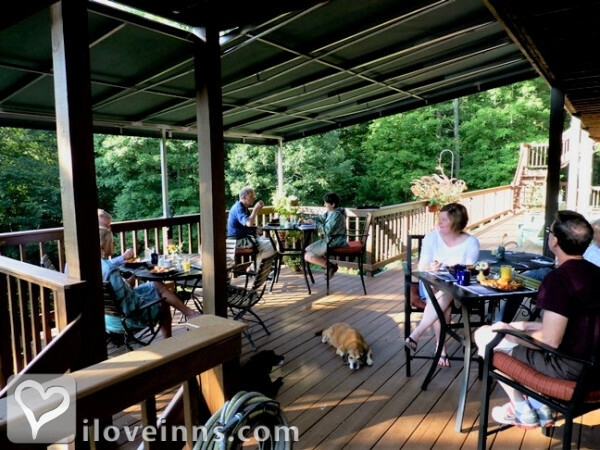 We enjoyed our stay at Bent Creek and the warm hospitality that is always shown. Delicious breakfast, warm cozy fires and beautiful scenery. Good luck to y'all in the new year! 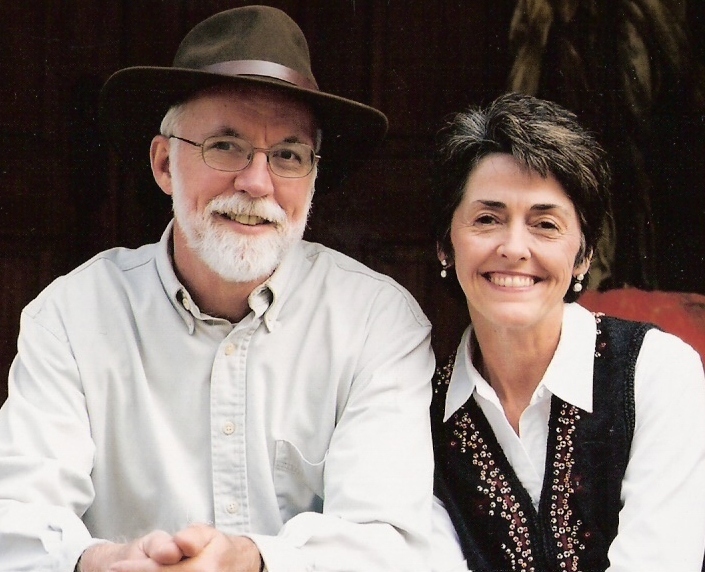 Thank you for helping make our 40th wedding anniversary celebration so memorable. What a lovely place! The personal touches and wonderful blend of private and community spaces are just what we were looking for. Doug and Jodee, Bonnie, Lisa, Zoe, (and more), What a wonderful team you are! Of course everything was wonderful, every comfort possible (down to building us a fire-thanks Lisa), putting a towel on the back porch for damp chairs, the wonderful beds, your kindness, your food...But even more, all the wonderful woodwork, clever artistic and useful designs, intriguing little creatures of clay, metal, stone and wood...You have made this place your own, from small detailing to the solid frame of the Wildflower room bed. Thank you. Meredith and I had a good visit with you here, and will each go to our own home refreshed. Hotels get old when traveling for work and I was looking for a place to end the monotony-BCL was just that. So comfortable and so beautiful. I only wish I could have stayed longer! 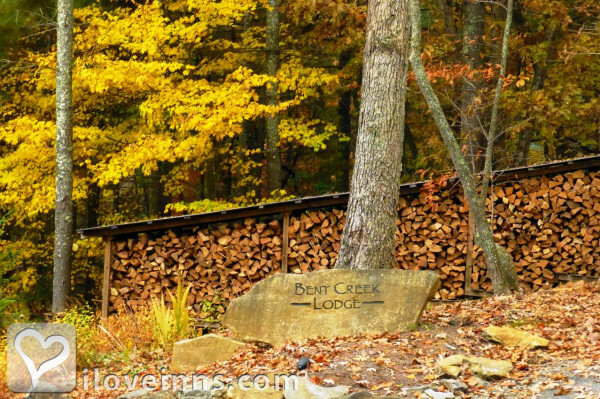 From the moment we checked in, we have been enchanted with the oasis of Bent Creek Lodge. The serenity of the gardens, the gentle water statue outside our room, the lovely swings, the evening music-impromptu jam-delicious breakfasts, afternoon collies and snacks. We are so grateful to have spent time here and can't wait to return. The owners have thought of everything! Loved the deck outside the Mountain Room and the outside entrance. We hope to come back! Stayed for first time, here on business for one night. Very nice place! Peaceful, hospitable, beautiful! I was bless to stay here. Thank you! Wish I could stay forever. For me this is a one night stay on my way to my son's wedding in Andrews, NC. I know the wedding will be beautiful, but Bent Creek is setting the bar pretty high. Hope to return in the future. Thanks to all of you for a warm and welcoming stay. From the beautiful majestic gardens to the yummy food and awesome staff, this has been just a wonderful get away vacation! Thanks for all you do! We will be back for sure!! We had a short but very sweet stay here in the Cherokee Room! It felt like waking up at home. We will miss this place and will be thinking about the next time we can come back to this beautiful place! This was our third time to visit the Lodge. We always enjoy mountain biking, visiting art galleries and shops and eating at the wonderful restaurants in the area. We have been to Asheville many times and this is by far our favorite place to stay. Often we make last minute plans so the lodge is full and we have to stay elsewhere, but we always call here first! We are already planning our next trip this fall. This was our first visit to the lodge and we had a wonderful experience! The lodge is beautiful and inviting. Our room was so cozy and comfortable and we really enjoyed sitting on the porches and hiking around the woods out back. We hope to visit again sometime! 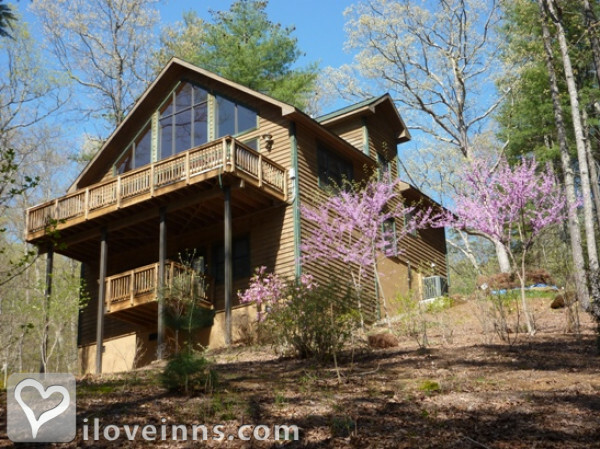 What a beautiful lodge you have here-off the beaten path but so convenient to Asheville. We so enjoyed our stay-particularly enjoyed sitting on the deck and watching the birds. And the breakfasts were scrumptious! Hope to come back again. The description of the lodge sounded awesome to us, We were not disappointed. Our stay was more than we ever anticipated. Great comfortable room, wonderful food and a perfect location. We visited the Blue Ridge Parkway, Asheville, as well as Blowing Rock and Grandfather Mtn. We will be coming back again soon. Thanks so much Doug & Jodee. We are so glad we stayed here with you. This is our first trip to WNC & it will not be our last. Your breakfasts have kept us fueled for hikes, Biltmore, and zip lining. Wow! Your staff is so kind, which comes from you. We have enjoyed conversations of shared interests and have met lovely people. We wish you continued health, peach, and love. We had an excellent time in this "Garden of Eden". The staff and owners and amenities were outstanding. What a pleasure!! Had a wonderful, peaceful and serene visit here. What a special retreat you have created. We felt your touch in every detail and, as creators ourselves, especially appreciated your attention to making each detail so lovely. Gardens and grounds and porches-all spectacular. On this trip we were avoiding crowds, busy highways and urban spaces. Our stay here was the icing on the cake! Thanks. Loved the shape and design of the Water Room. Room to spare in the shower. The designing touches were so appropriate to our room. Cozy and cool in spite of the hot weather we are not used to experiencing so early in spring. As a result of your feasts for breakfast, my wife and I made a promise to each other to cut back on food and do a lot more walking. At this location we just scratch the surface of places to see and thins to do. Didn't miss T.V either. Loved the breakfasts outdoors in the warm sunshine. We'll be back! Bent Creek was a perfect destination for our girlfriends' outing! 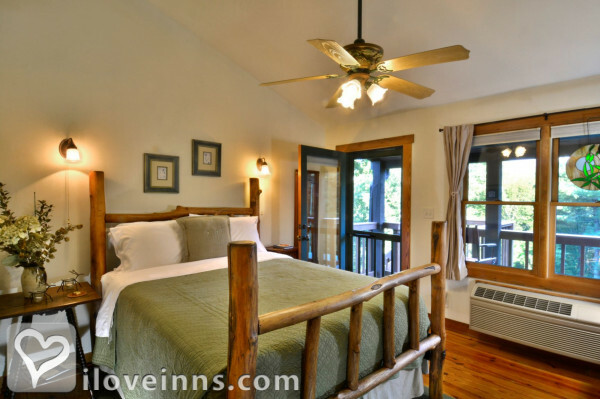 Very comfortable common areas and bedrooms and wonderfully serene outdoor seating and views. Hope to bring my husband in the future! Delicious breakfast. Bent Creek is a lovely B&B near Asheville. The building was designed and built by the owners. We were warmly welcomed by Lisa. We stayed in the Wildflower room. 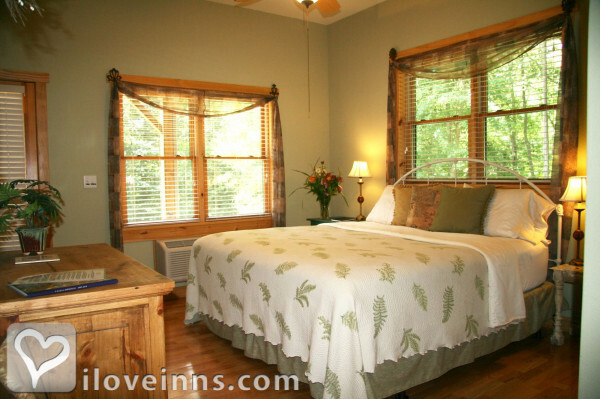 Each room views the lovely wooded grounds and opens to a small balcony that overlooks the woods. The room was lovely, but I have some mobility issues and the bed was very high. Also the tub in that room was difficult to get in and out of to shower. Had we been staying more than one night we would have asked for a change, which I'm sure would have been fine. Just be aware if you are short or have mobility issues that this room might not be the best choice. The photos seem to indicate other rooms have beds that are not so high. We would certainly stay there again if we travel to or through Asheville. Breakfast was excellent and just right. We had apple pecan French toast with eggs, bacon and fruit. Overall, a great stay, with just that one blip that is easy to avoid by paying attention to the room choice. Had a wonderful three days staying here. Great location and very quiet. Great breakfast and very helpful owners. We would definitely return. Just what we were looking for, and more!! It was absolutely wonderful! We are looking forward to returning during the winter months to enjoy the winter view! Can't wait! My wife and I stayed for just one night. The first place we stayed we were dissatisfied with so we made arrangements to stay at the Bent Creek Lodge. It was exactly what we were looking for, we should have stayed the other nights there as well. We will from now on when we visit Asheville. We had a wonderful time and are extremely happy to have taken a leap of faith to give it a try. It had the feeling and warmth of home, but the privacy awarded by 4-star hotels. 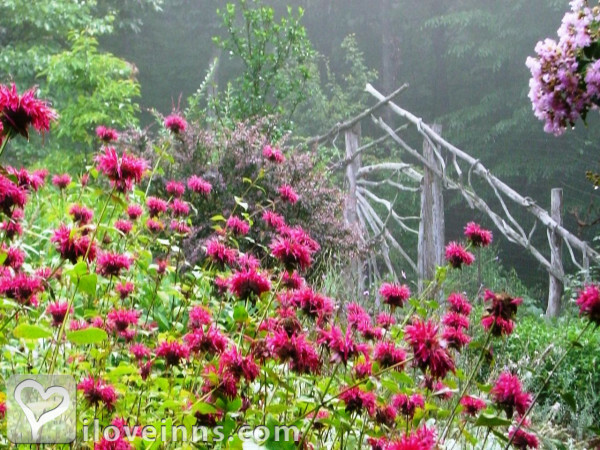 The NC Arboretum spreads over 434 acres within the Bent Creek Experimental Forest, surrounded by the Pisgah National Forest. We thoroughly enjoyed our too short a time with these hospitable people. We highly recommend this lovely picturesque lodge and wish we could have stayed longer. Thank you! My husband and I wanted to get away to the quiet and beauty of the Smokey Mountains area. We could not have selected a better B&B for the trip. Driving in, we were a little nervous since our directions didn't seem to be taking us too far off the experssway - but then we turned onto the Bent Creek Road and all was serene and wonderful. The house itself is wonderfully homey and inviting, while keeping an element of sophisitcation, not often seen in B&Bs. Jodee is a delight. She's also very helpful and a fantastic cook! We took walks on the property, went hiking in the very nearby arboretum and explored the Parkway, and were still centrally located to longer exploration destinations and the yummy restaurants of Asheville itself. We will certainly be back! My wife and I definitely enjoyed our stay at the Bent Creek Lodge. 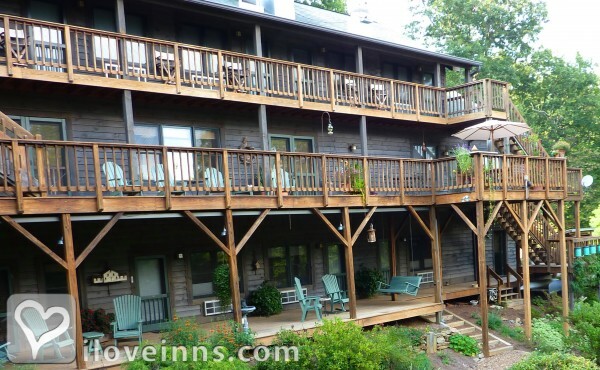 The Lodge is a relaxing, secluded, well-maintained, welcoming, and refreshing experience that I would recommend to anyone looking for a reasonably priced bed and breakfast convenient to Asheville. 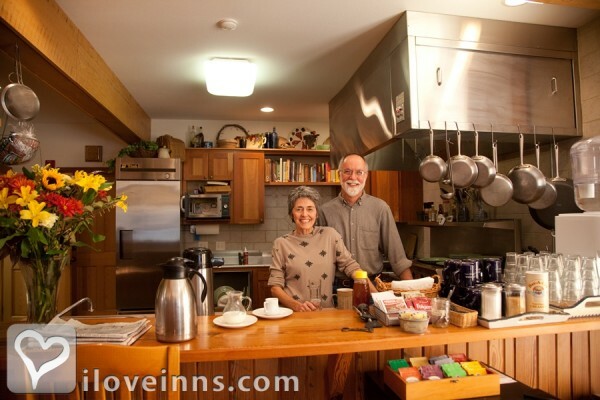 Doug and Jodee are very kind innkeepers and their breakfasts are delicious! 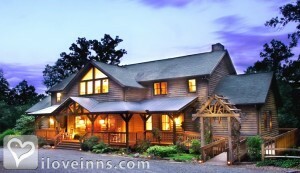 When we visit Asheville again, Bent Creek Lodge will certainly be our first choice of accommodation. Staying at the Bent Creek Lodge was my first expierence at a bed and breakfast. It was such a wonderful time! The lodge is beautiful inside and out. Jodee and Doug have put a lot of attention to the details of making there guest feel at home and accomadated with everything to make your stay enjoyable and comfortable. I will definately be returning and I hope soon!! Oh and by the way, the breakfast was gourmet delicious!! Not being much for period antiques and Victorian fluff, we chose this beautiful Inn set into a wooded hillside just outside of Asheville . This rustic lodge (designed and hand built by the owners) was very comfortable, with lots of decks to sit out on, nice ground to explore and the tasteful decorations of the "Bike room" room really appealed to me and my GF. The hosts (Doug and Jodee) were awesome and gave us just the right amount of attention. They made last min. dinner reservations for us, recommended a spa for massages, and providing us with a trail map and Mnt. biking trail recommendations so we could explore the nearby Bent Creek Mnt. bike trails. The food was great. Jodee has a culinary degree and it really showed! (fabulous brownies and banana stuffed French toast!) We cant wait to make a return trip! We spent 2 1/2 days at the Bent Creek Lodge and truly enjoyed everything from the crisp clean rooms to the delicious breakfast and the warm friendly welcome we received from the the inn keepers. It was a wonderful experience. My wife and I spent our honeymoon at Bent Creek Lodge. It was better in person than in the pictures. I just can't thank Jodee and Doug enough for their Hospitality. 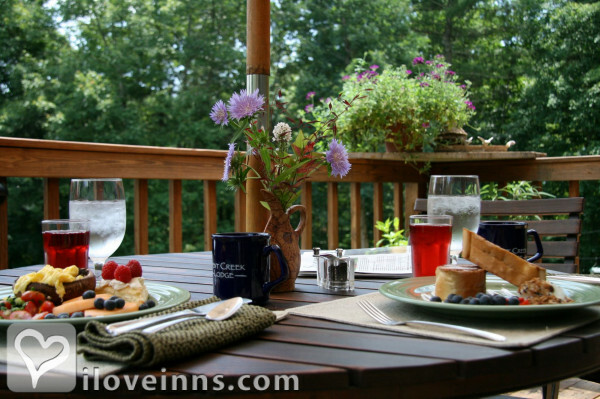 Beautiful views, Excellent Breakfast and Convience to everything Asheville has to offer. We stayed her for our engagement annoucement and it was so wonderful that we are going back again soon! This place, it is wereth every dollar and then some. Doug and Jodie ARE GREAT PEOPLE!! EVERYONE NEEDS TO GO!! 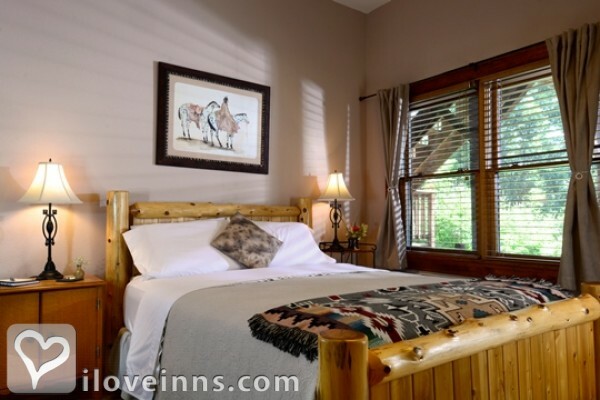 You will not regret your stay at the Bent Creek Lodge. It feels like a 5-star luxury resort, while maintaining a comfortable homey quality. It is beautiful, both in setting and in design. If you want privacy, you have it, but if you want fellowship, you can find it. The owners have thought of everything, and I mean every little thing. You have access to free wi-fi, dozens of restaurant recommendations, and pre-printed instructions on how to get there, keys to both the front lodge entrance, AND to your own room's back door! Coffee, tea, fresh water and ice, refrigerator, multiple gathering rooms, if you are traveling as more than a couple. 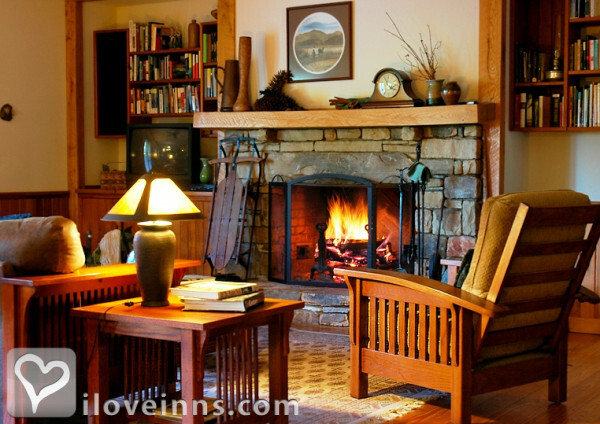 There are options for reading, a cozy fireplace, billiards table and more. Breakfast is delicious, and so uniquely enjoyable, that you may want to buy the proprietor's cookbook like we did, and we don't even cook! The forested moutainside location is a veritable bird sanctuary, the parking is ample, and the location is convenient to area pursuits, but still out of the way. In-room massage therapists can be arranged, and we highly recommend doing that - ask for Jennifer, and get the best deep tissue massage you will ever have! We would choose Bent Creek again just for that experience, even if there weren't many other reasons. What a beautiful, restful and inviting Inn! 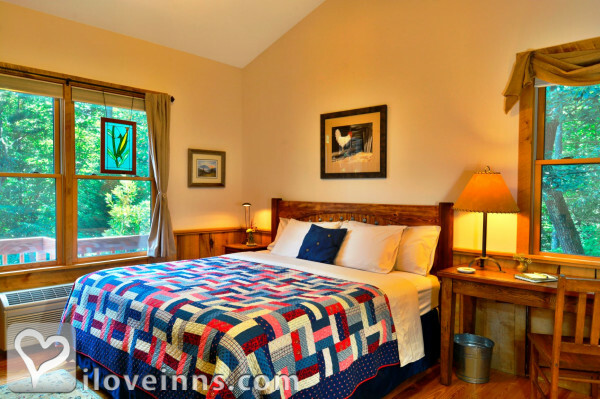 We were traveling with friends from CO on the Blue Ridge Parkway and each of our rooms were special. The porch swings, living rooms and garden call you to relax and enjoy. The breakfast and snacks were delicious! Both Doug and Jodee were very helpful with recommendations and directions. We wanted to stay longer. We'll be back! Be sure to drive the Parkway, see the Biltmore estate (Jodee will buy you tickets) and visit Wheels of Time motorcycle museum in Maggie Valley. Enjoy! For the short visit we had, we had a great time! Asheville Citizen Times, Atlanta City Magazine, Outdoor Explorer Magazine, National Geographic Adventure Magazine, USA Today.